For those who bump hip hop underground you know about Dumbfoundead but those who don’t. He is unsigned raw talent that shouldn’t be considered another “Youtube sensation.” Dumb is no amateur when it comes to rapping and has dominated LA’s underground circuit. Very much capable of writing hip hop songs that go beyond money,cars and scantily clad women. His latest song “Are We There Yet” kinda hits home for me. The song isn’t some random repetitive club anthem but Dumb showing love to his mother and the trivia of fast love. Don’t you just love covers that reeks total awesomeness? Dumb takes Diplo “Knock Out” and pretty much does a sweet cover. Giving GD&TOP run for their money or heads up. For the life of me can’t understand why a talented MC like Dumfoundead hasn’t made it to BET’s Cypher? The Finest Asian American and Canadian hip hop artist combine to create one monster remix. Was hat a run on sentence…maybe. Either way Dumbfoundead, Jay Park, J.Reyez, Flowsik, Chan, Johnny Phlo and little miss Ailee blow ta mind. Knockstudy.org is a youth center organization in California.That helps disgruntled youth find some sense of stability.Lets just face it not all of us come from picture perfect backgrounds or made good choices.This center is to help those kids in need of something more positive and productive in their lives.Using the power of music and the community Knock Study has even help the most stubborn.Find a passion they didn’t know or given it a little direction.You can enroll or volunteer keep in mind.You must maintain a 2.0 GPA and good behavior. Knockstudy is a youth program focused on building skills in DJing and music production.With the partnership of the Bresee Foundation, a nonprofit community center, the Knockstudy program provides access to DJ/music production equipment and talent. Thanks to Dumbfoundead for spreading the word and being apart of this program. wax and Dumbfounded team up for “It’s On.” Funny little MV for those who bump underground on the west coast side. “It’s On” feature on Wax’s Clockwise dropping on the 31st of May. 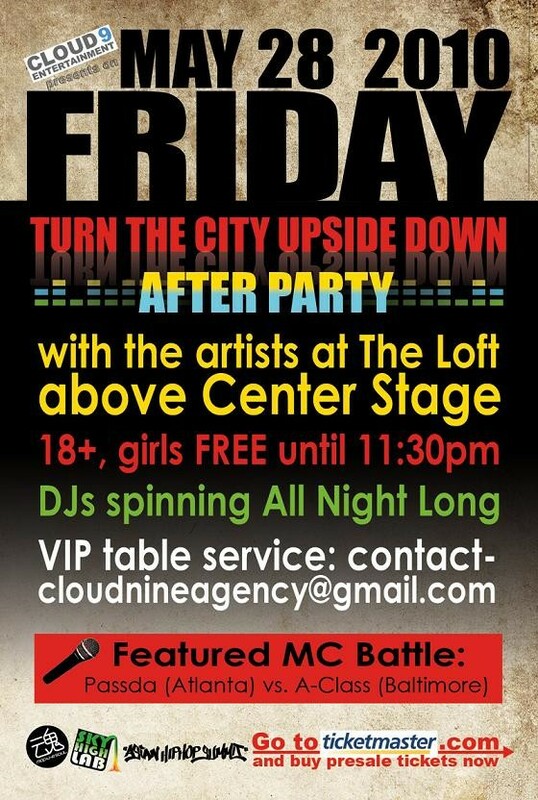 On May 28th, 2010, Cloud 9 Entertainment presents TURN THE CITY UPSIDE DOWN. 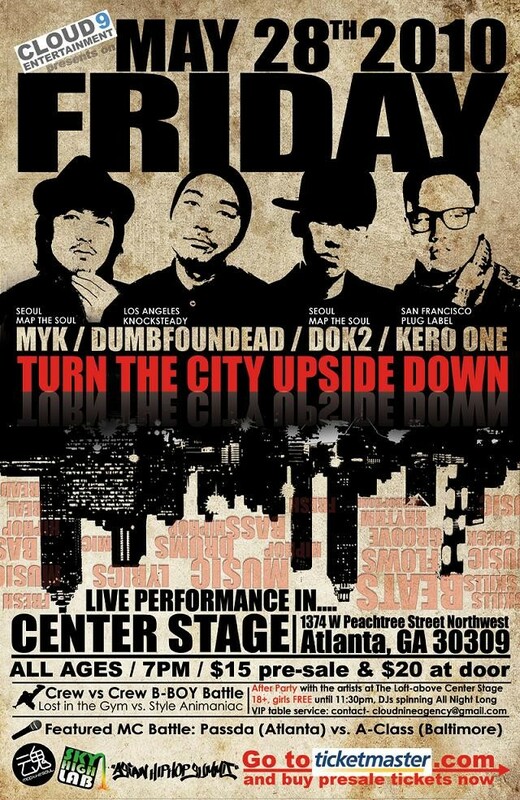 This international hip hop concert at Center Stage in Atlanta features two of South Korea’s most accomplished rap artists sharing the stage for one night with two renowned Korean American rappers from the West Coast. Associated with South Korea’s #1 mainstream rap group Epik High, the four touring performers–Dumbfoundead from Los Angeles, MYK from Seoul, Dok2 from Seoul, and Kero One from San Francisco–are an unprecedented gathering in the Deep South of elite Korean hip hop artistry. This Atlanta concert is the tour’s only show east of the Mississippi River. Also featured during the concert will be local Korean hip hop artist Passda, a crew bboy battle with Style Animaniacs challenging Lost in the Gym, and an epic MC Battle pitting Passda of Atlanta vs A-Class of Baltimore, the first Korean vs Korean rap battle. The diversity and skill of the headliners make them appealing not just to Koreans but to anyone in Atlanta who loves hip hop or appreciates good music. Dumbfoundead is a master lyricist and freestyle artist, battle champ, and Youtube sensation who grew up in inner city Koreatown, Los Angeles. MYK is best known as the fourth member of Korean supergroup Epik High. He is signed as a solo artist to Epik High’s label Map The Soul. Dok2, who raps in Korean, is the youngest member of the legendary Movement Crew, which also boasts members Drunken Tiger, Tasha, and many others. Kero One is a soulful and innovative rapper and producer from San Francisco who has been endorsed by Will I Am. Together, these artists are determined on May 28 to TURN THE CITY UPSIDE DOWN. Center Stage is located at 1374 W. Peachtree Street NW, Atlanta, GA 30309. The concert begins at 7pm, ending around 10:30pm, with an afterparty immediately following at The Loft, located directly above Center Stage. The concert is all ages, $20 at the door, and $15 on Ticketmaster, but the afterparty with the artists is 18+, ladies free until 11:30pm, with VIP service available. Contactcloudnineagency@gmail.com for more information, or go to www.skyhighlab.com or www.asiaticempire.org. TURN THE CITY UPSIDE DOWN is brought to you by Cloud 9 Entertainment, Sky High Lab, Asian Hip Hop Summit, and Map the Soul. DUMBFOUNDEAD. A Korean MC from Los Angeles famed for his caustic wit, intricate wordplay, and freestyle ability. He is a Youtube sensation and rap battle champ who is also associated with Epik High and Jay Park. MYK. From Seoul, MYK is signed to Map the Soul, the label run by Epik High, the first South Korean music act to reach #1 on Itunes. DOK2. Signed to Map the Soul, Dok2 from Seoul is also the youngest MC from the legendary Movement Crew. KERO ONE. San Francisco’s top Korean MC who also produces his own beats.